Blogs on Oracle.com coming soon? 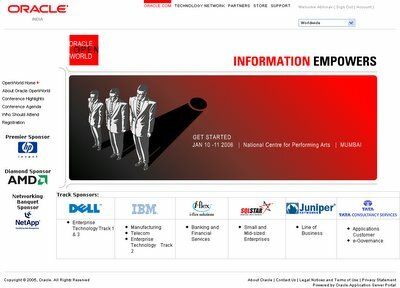 So far the only official Oracle blogs have been by some of the senior mangement folks in the Apps division: John Wookey, SVP of Applications Development, Jesper Anderson, SVP of Applications Strategy (formerly from PeopleSoft), and John Schiff, VP and GM of JD Edwards World (link to executive blogs page on Oracle.com). But no other employee blogs are hosted on Oracle.com. On a lark I entered www.oracle.com/blogs in my browser. I first got redirected to http://www.oracle.com/blogs/index.html and then to http://www.oracle.com/technology/community/opinion/index.html, which happens to be the home page for all links to Oracle technology related blogs. I am using this very sparse and frankly thin piece of page redirects evidence to surmise that Oracle may come out with a comprehensive blogging infrastructure like hosting support (like a blogs.oracle.com or other URL) and software for blogs. Currently, as people would know, Oracle blogs are hosted on third-party blogging sites like Blogger, Livejournal, or on Orablogs.com. Companies like Sun, Microsoft, and others have a substantial blogging presence by their employees. For those who missed it, Oracle Application Server 10g Release 3 (10.1.3), is now RTM and available for download from OTN (link to download page). This is just the first of the R3 releases, and the version number reflects that (10.1.3.0.0). This contains the core app server components like Oracle HTTP Server, Oracle Application Server Containers for J2EE (OC4J), Oracle Enterprise Manager 10g Application Server Control, Oracle Business Rules, and Oracle TopLink. Portal, Integration, BI components and more will be added to this in later releases. So, for those who may ask, "what is the latest Discoverer release", the answer continues to be 10.1.2.48.18, available with Oracle Application Server 10g Release 2 (10.1.2.0.2), available from this download page. If you want the latest Discoverer release, then this is the version that you need to download and install. And for those clued in on the RSS revolution, OTN has added a new page for new downloads (link to page) as well as an RSS feed (link to RSS XML feed) so people can simply add the feed to their favourite RSS reader (think Thunderbird) and see a list of new downloads added. In addition Badline can be used to uncover additional information about an error. (PRG= UTILS!CALC_FCAST_MODEL) (PRG= UTILS!CALC_FCAST_MODEL) "
if line includes a colon, this indicates execution of uncompiled code. Typically, uncompiled code is slower to execute than compiled, as it has to be parsed and validated prior to execution. If the line is executed within a loop then this could consume a large amount of processing time. Uncompiled code usually occurs when dynamic substitution is used to alter the way a line is executed as shown above. In this case the time dimension is limited to a specific dimension member that is not known until execution time. Hence the &arg1 is used to parse the first argument passed to the program. This can be set to get more detailed error messages in the log file and may help to provide more information regarding a particular issue. The MONITOR command records data on the performance cost of each line in a specified program. 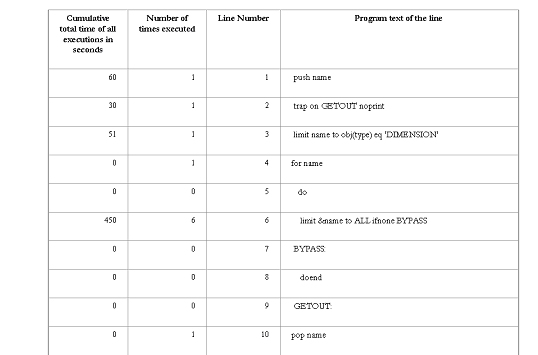 It is used to identify the time-consuming lines within those programs.–If the program executes a given line repeatedly, MONITOR records the cumulative cost of all the executions on the single line –A line of code is considered to have a high performance cost if it takes a long time to execute. If you wish, you can use both TRACKPRG and MONITOR simultaneously. Tracks the performance cost of every program that runs while you have tracking turned on. 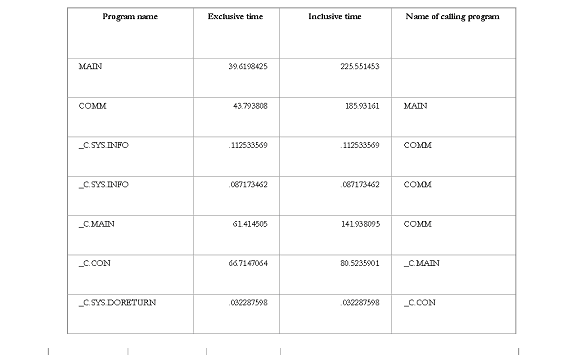 Each time each program is executed, TRACKPRG stores its cost data as one entry in its tracking list. A program or line of code is considered to have a high performance cost if it takes a long time to execute. 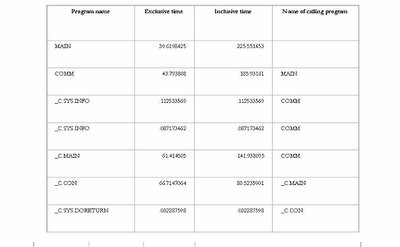 Use TRACKPRG to identify programs that have relatively high costs and then use the MONITOR command to identify the time-consuming lines within those programs. If you wish, you can use both commands simultaneously. With the help of these three debugging options it is possible to determine how and why programs are being executed within the AW. Once you know where the problem is, then you can use the OLAP Worksheet within Analytic Workspace Manager to edit the program and make the required changes. "Oracle India Managing Director Krishan Dhawan also announced that the conference theme would be Information Empowers, saying, “Information is the new currency in the global market. Indian companies are increasingly becoming a part of the global economy and are realizing the importance of empowerment through information to effectively compete at global levels." "In the past five years, Oracle invested nearly $2 billion in India to support company initiatives, such as its development centres, in-kind education donations, investments in companies like i-flex, and commitment to employees. Under the new expansion plans, Oracle is scheduled to increase its presence in nine non-metro cities, including Ahmedabad, Chandigarh, Coimbatore, Indore, Jaipur, Kochi, Lucknow, Pune and Vishakhapatnam. Oracle expects to increase its total headcount in India to 10,000 over the next eight months." "Oracle will also rewrite its software in seven new Indian languages, in order to cover all the national languages. Besides this, the company has assured that it will be flexible on payment schedules for contracts involving smaller firms or rural projects in India." "Research firm IDC estimates that IT spending in India has reached $9 billion in 2005 and will grow to more than $17 billion in 2009. Only about 1 percent of Oracle’s revenue already comes out of India, FTN Midwest’s Mr. Chowdhry said. Currently, more than 80 percent of Indian banks and 90 percent of Indian telecommunications companies are Oracle customers. The company has more than 6,000 database and middleware customers and 400 applications customers in India." "“India and China are the two key markets for us as far as the Asia-Pacific region is concerned,” Oracle senior vice-president (Asia-Pacific) Keith Budge told reporters here today. “India is being increasingly seen as a priority market for research and development and services,” he added." 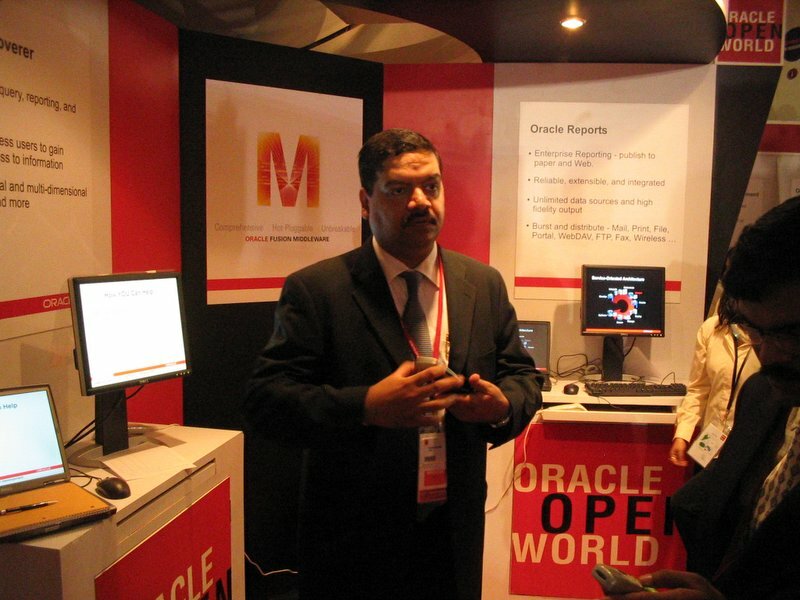 "Oracle is also currently working with 28 Indian state governments to develop, test and deploy e-government projects in the country. The software company said it is currently engaged in more than a hundred Indian government projects. " "Oracle is in talks with the Government for use of its database products for Village Service Centres (which will provide a range of information and records), the company is awaiting cabinet clearance for this, he said. Other large e-governance projects in which Oracle is interested are the national ID project, customs and excise department projects." 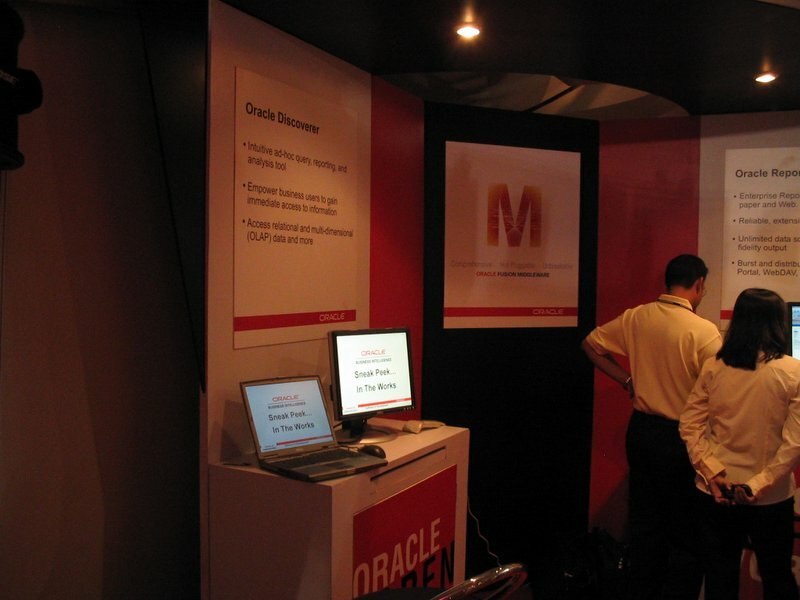 In one place, includes posts on OOW Mumbai 2004 and 2006, as well as photos of the city. Mark Rittman has a post (link to post) on his blog titled 'Siebel Analytics - The Jewel in the Project Fusion Crown?' with a brief overview of Siebel analytics and speculation on how Siebel Analytics and Oracle BI may integrate. A little searching on the net (ok, all I did was 'Google' around) shows that Siebel bought a company called nQuire in Oct 2001, that had been founded by Larry Barbetta in late 1999. This acquisition brought to Siebel nQuire's integrated zero footprint web client and an analytics server. This acquisition is what Siebel built upon and is now Siebel Business Analytics version 7.8 (released late last year). Larry B is now SVP and GM of Siebel Business Analytics. Public statements from Oracle executive management advertising Siebel's BI applications as "hidden jewels" (link to article). Once things are finalized and senior management communicates its direction and vision for BI - the what, how, and why - I shall bring it here, on the Oracle BI Blog. This (the photograph below) is the Discoverer pod at the left, and the Reports pod to its right. I had a laptop with 2GB RAM with all the software needed installed on it (10.1.2 infrastructure database, a 10.2 database, middle-tier, Add-Ins, and more), so that I didn't have to rely on a network connection. Network connectivity was quite good and I don't think I would have had problems with network speeds, but anyway. Each pod also had a 17" LCD monitor, so I could have the presentation/demo on two screens - the laptop and the monitor. This helped. Not everyone likes peering into a laptop screen. I had prepared a set of slides that ran in autoplay mode so that people walking by would get to see something interesting and hopefully stop by to see the software. The presentation itself ran for less than 4 minutes in autoplay mode and had lots of screenshots and very big font size text. In the end it turned out that I walked only a few people through the presentation. Most were interested in seeing the software as you can see below. I think the lady in the photograph below is from India's largest airline and are using Discoverer 9i. She was very interested in the new features of the 10.1.2 release (thanks to Navneet Singh, Oracle Reports PM, for snapping this photograph). Over a period of two days at the demogrounds I spent close to 14 hours on my feet at the Discoverer pod and showed different parts of BI 10.1.2 to what seemed like a never ending stream of visitors to the Discoverer pod. I am waiting for the final scan numbers from marketing so I may be able to put a number to infinity. Most of the software I demoed was production, but two components in various stages of development that I showed to people were the update to Discoverer Plus OLAP with custom-member support, and a new work-in-progress to our BI-Office integration suite. Those who were either using Discoverer or a competing product, or those who were in the process of evaluating a BI tool, and therefore had an understanding of BI and BI Tools and their capabilities. About 15% of the visitors were in this category. 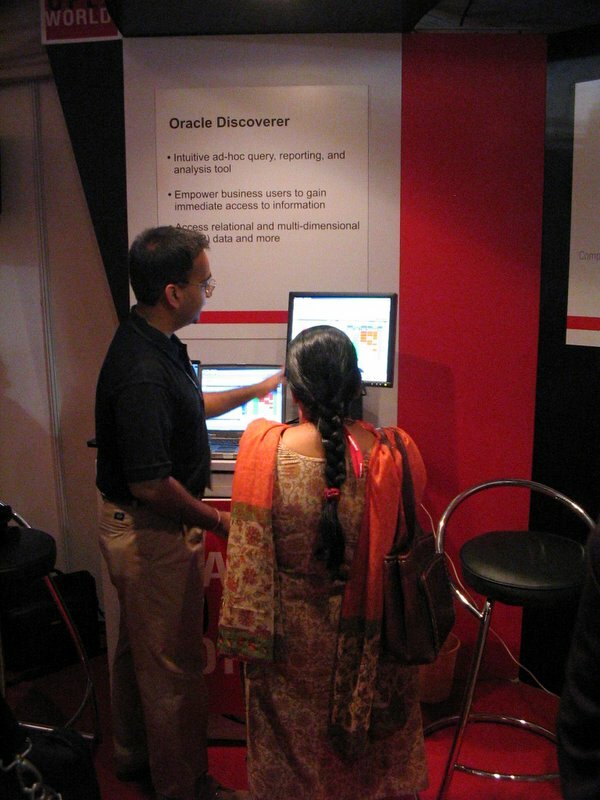 Those who were implementing Oracle Apps and wanted a reporting tool and had heard of Discoverer as an option available. There were a lot of people who fell into this category, probably close to 40%. While demoing to these first two categories my comments on the user-friendliness of the tool, its export capabilities (Excel and PDF were the most popular), and the ability to create powerful OLAP calculations without writing or seeing any SQL was met with appreciative nods (nods are very important when demo-ing software..., as opposed to shakes of the head, or worse, blank stares and not too stifled yawns). 1. The BI market in India is small, very small in fact, but growing fast. 2. The push for BI seems to be coming predominantly from customers implementing an ERP solution and then looking for a BI tool. Oracle and PeopleSoft have a proportionally large install base in India, so this acts as a pull for BI tools. These companies have small budgets and rule out independent vendors like BO and Cognos on the price factor alone. 3. As more companies in India reach a size where they feel the need for an ERP solution and can afford one, the number of BI customers will only increase. I can download it free??? People were skeptical that even within the constraints of a developer license and mult-gigabyte download sizes the product could be downloaded free, that there were no built-in expirations, that the software was not a crippled version, and that the version of Discoverer I was demoing was the same as was available on OTN (10.1.2.0.2). Of course if I were given to cynicism I may think that they wanted to make sure they could use the software and not pay for it. Possibly. But I think I would be happy dealing with a compliance problem rather than an awareness problem. "My CIO/boss/manager will love this"
"That's it? This is all that is needed to publish this report to portal??" For some visitors I went through the steps of creating a Discoverer worksheet, adding a Discoverer portlet and configuring it to display the worksheet just created, all in less than 3 minutes (maybe four or five at the most, but then, no one was timing me). "Discoverer is free with the app server?" "There is no ActiveX here?" - looking at Viewer and Portlet customization capabilities and its cell selection and formatting capabilities. "This runs on Firefox also?" i.e. can I run this on Linux also? 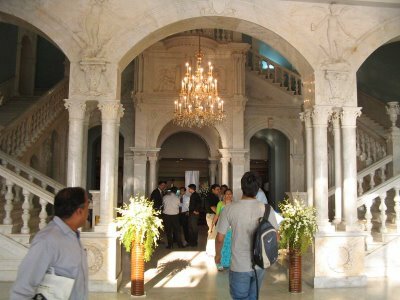 If you visit the Tata group web site (link to page) you can read some interesting facts and trivia about the Taj Palace and Tower hotel. The foundation of the Taj Mahal, laid in 1898, is 40 feet deep. The hotel was built at a cost of more than Rs 4 crore. It was the first building in Bombay to be lit by electricity. A suite of rooms, including full board, cost the princely sum of Rs 30. Jamsetji Tata had visited the famous Paris exhibition at the turn of the century (for which the Eiffel Tower was built). He saw there pillars of spun iron displayed for the first time, and ordered 10 to be shipped home for his new hotel. Today they seem indestructible as they continue to hold up the hotel's famous ballroom. As you can see below, the building on the left is the old Taj building, now called the Taj Palace, while the hotel on the right is called the Taj Towers. In the late 1800s, Jamsetji Tata took a foreign guest to dinner at a hotel in Bombay. The doorman told him, his guest was allowed but not him as the hotel was "only for Europeans". As things stand today, that 'for Europeans only' hotel does not exist, while the Taj hotel in Bombay is one of the finest hotels in the world. Wikipedia has a short but useful writeup of the Gatway of India (link to article on Wikipedia): The Gateway of India was built to commemorate the visit of King George V and Queen Mary to Bombay, prior to the Darbar in Delhi in December 1911. The foundation stone was laid on March 31, 1911 by the Governor of Bombay, with George Wittet's final design sanctioned in August 1914. Between 1915 and 1919 work proceeded on reclamations at Apollo Bunder for the land on which the gateway and the new sea wall would be built. The foundations were completed in 1920, and construction was finished in 1924. The Gateway was opened on December 4, 1924 by the Viceroy, the Earl of Reading. The last British troops to leave India, the First Battalion of the Somerset Light Infantry, passed through the gate in a ceremony on February 28, 1948. Going to an event like Open World is always a special experience. The opportunity to meet with so many customers and people interested in your products is simply unmatched. And in a market like India where BI is still an emerging and evolving field, the opportunity to actually show the value of BI to users and customers for the first time is enlightening (more about that later). There were also a large number of sales and pre-sales people from APAC at this Open World, so I got to speak with them face to face and get their inputs and feedback on what they like and would like to see improved (talking face to face is so much better than conversing over email, phone, or IM as you can get frank feedback, immediately.). 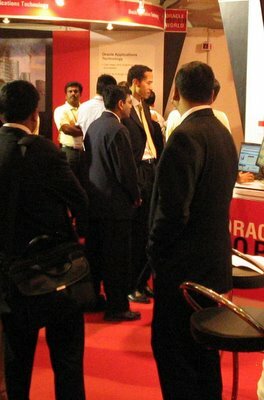 The Mumbai Open World was one of only two mini Open Worlds to be held in APAC (Asia-Pacific) this year, the other one being in Japan (link to Oracle Open World Japan site), and Oracle acknowledged this as a recognition of the importance of the Indian market for Oracle as well as its intent to grow its Indian operations (which according to press releases are expected to touch 10,000 employees by the end of 2006). 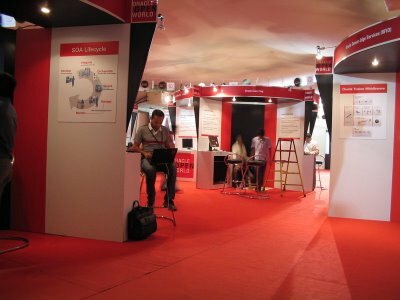 Oracle has been in the Indian market for 19 years now, while its development center in Bangalore has been around for close to 10 years (link to more information on Oracle India and link to Oracle India factsheet). 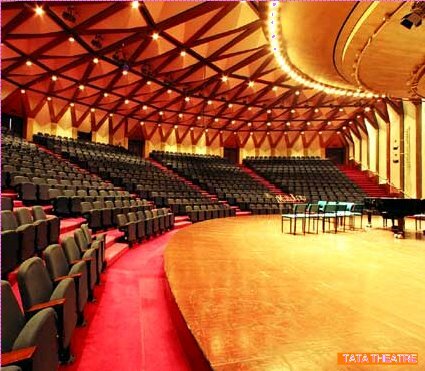 This year's Open World in Mumbai, like the one in 2004, was also held at the NCPA (National Centre for the Performing Arts). 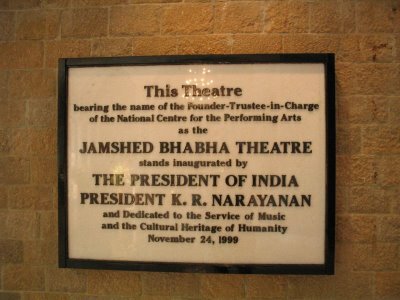 If you visit its web site at http://www.ncpamumbai.com/aboutus/aboutus.asp, you will learn that the NCPA is India’s premier socio-cultural centre, and was gifted by The Sir Dorabji Tata Trust to Mumbai and India, and was established to preserve, facilitate and promote India’s rich art and cultural legacy. 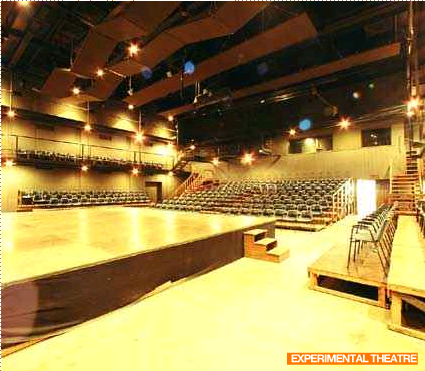 This below is a photograph of the Oracle demogrounds, called 'Exhibits 360 Degrees'. 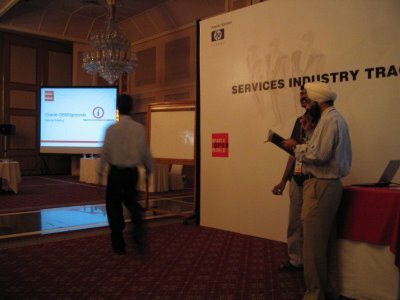 Those that attended the conference at Mumbai in November 2004 will remember that the demogrounds were in the Hilton hotel, and both Oracle and partners had to share a cramped space hall. This time Oracle and partners were separated out into adjacent tents. Yes, I said tents. These were very large tents, with very large mobile air-conditioning systems pumping in lots of cold air. Even though it was the month of January, Mumbai was experiencing a heat wave of sorts, with the mercury touching 32-33C (that would be close to 90F). Fortunately it was not as humid as Bombay can become. This photograph below was taken the day before the conference began, on Monday. Strictly speaking the conference began on Monday, with a special meeting of select customers, but as far as sessions, tracks, and keynotes went the conference got underway only on Tuesday. As you can tell, if it were not for the last minute, nothing would ever get done. An employee briefing for employees, from India as well as visiting from other countries, was held on Monday at the Regal room of the Hilton at 2pm. Most of the stuff was routine. The only moments of levity were provided by the person responsible for security at the venue. His advice was threefold: first, visitors when leaving the hotel should lock their passport and tickets in their hotel room's safe; second, people taking a walk or jog on Marine Drive should beware of an old scam perpetrated that could see you lose your wallet before you could say 'arey'; and third, people at the demogrounds should watch out for a very suave and well dressed gentleman whose speciality is to visit such conferences and walk out with a dozen laptops. These are the attendee badges, waiting to be handed out to delegates and speakers. 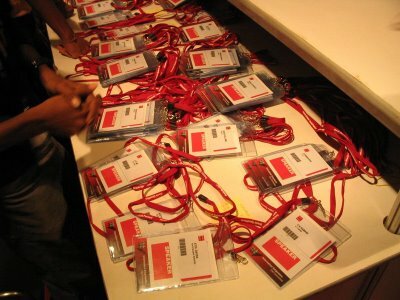 You can spot speaker badges of Derek Williams (EVP, APAC), S Ramadorai (MD, TCS), CK Ramani (UTI Bank). This is Rajesh Gadodia in a reflective mood before his session presentation on business intelligence dashboards. I am back in office after Oracle Open World at Mumbai last week (link to Open World Mumbai page on Oracle.com). Catching up on a few hundred emails. I shall write up a couple of posts on the Open World experience later this week, though I spent almost all of OOW at the demogrounds, spending 6-7 hours each day at the Discoverer and BI booths. One of the highlights for the Oracle employees at the demogrounds (called 360 degree exhibits) was the visit by Charles Philips (along with Derek Williams, Mark Gibbs, Krishan Dhawan and others) to the demogrounds. He stopped by the Business Intelligence booth and briefly saw the integrated BI demo. At that time I was busy at the Discoverer pod with a number of visitors, so this lone photo is all I could manage. The person in the foreground with his face turned away is Rajesh Gadodia, while the person hidden behind him in the white t-shirt is Balaji Krishnan. And the tallest person in the photo is Charles Philips. I have just finished uploading a couple of new docs to the Discoverer site on OTN (link to site). The first is the "Capacity Planning Sizing Calculator 10g (10.1.2.0.2)" (link to .XLS file on OTN). This calculator has been updated for Discoverer 10.1.2.48.18 (which is the Discoverer version in the latest Oracle Application Server 10g Release 2 (10.1.2.0.2)). You can use this to get CPU and memory sizing approximations for Solaris and Linux. The Linux calculator is the new addition as we found that the number requests for scalability numbers on Linux had steadily increased since we last did the paper for 10g (9.0.4). The second doc is a presentation on Discoverer 10g (10.1.2) Best Practices (link to PDF on OTN - it is a 2.9MB PDF file) that Mike Donohue had done at the 2004 San Francisco Open World. Highly recommended. The last Open World held in Mumbi was in November 2004. This is the link to the 2004 Open World site, and you can download presentations from the conference here (link to presentations download page). Sudip Majumder and I had two presentations on BI in 2004. 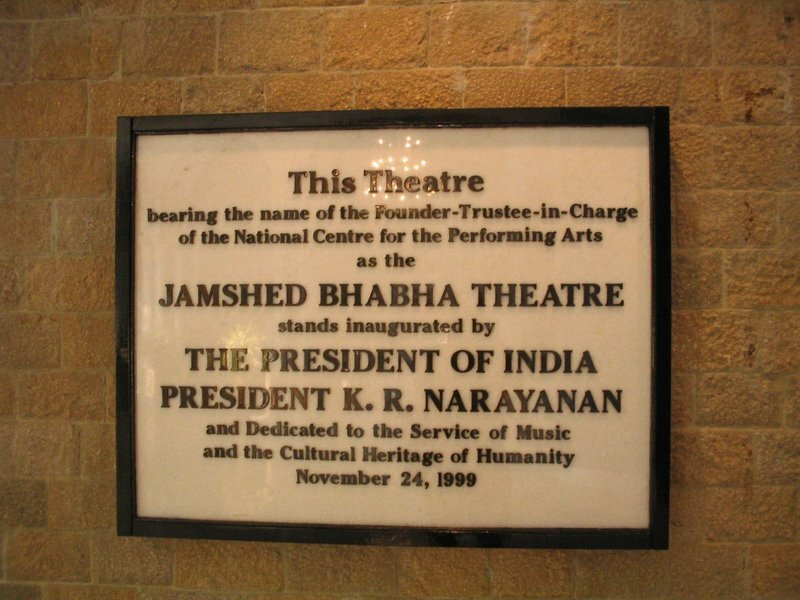 "... stands on the southern tip of Mumbai’s Marine Drive promenade, The National Centre for the Performing Arts, is India’s premier socio-cultural centre and perhaps the only one of its kind in Asia. " 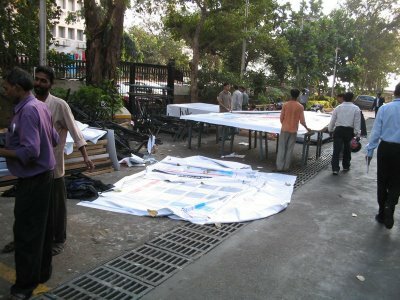 I shall post photos of NCPA next week, but in the meantime here are some photos from the 2004 Open World, Mumbai. The BI demo pod, seen above, was kept very busy by customers who were interested in the new features in Discoverer 10.1.2 and wanted to upgrade from 9.0.4, 9.0.2, 4i, or even earlier versions. What they saw they liked. There were many others who were not aware of what Oracle offered by way of BI products and went back impressed. One person took a brief look at the drag and drop interface of Discoverer Plus with its query wizards, crosstab support, graphs, and said, 'this is so much better than what Microsoft offers' and went on to have a lengthy conversation with a sales consultant on the spot. 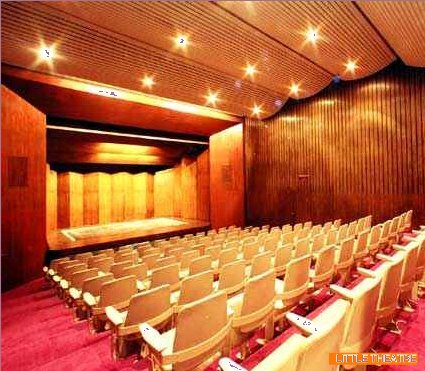 This is the main auditorium at the NCPA, where the keynotes and some presentations were held. 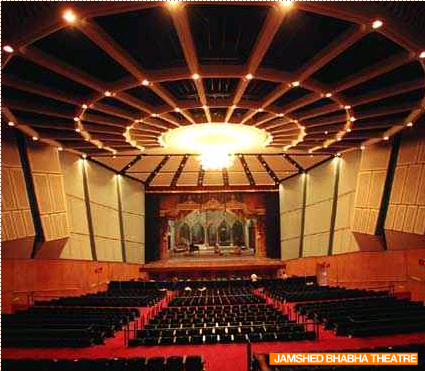 The auditorium can seat close to a thousand people. Sudip's BI presentation was very well attended. 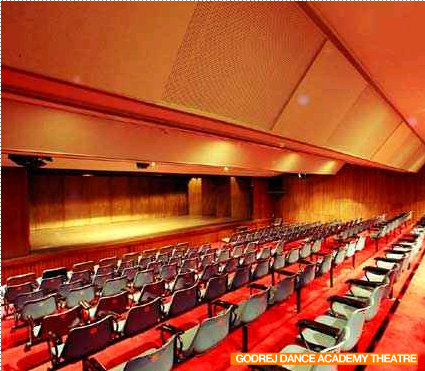 As you can see from the photo above, the room could seat about 150 people, all seats were taken, about a couple of dozen people were standing at the back, and an equal number could be seen waiting outside to get in. This is a photo of Bombay's Marine Drive, also known as the 'Queen's Necklace'. On the left side you have the Arabian Sea, while on the right side you have some of the most expensive real estate in India (well in excess of 20,000 rupees per square foot... that would be more than US$400/sq ft). The floodlights you see in the background are of the Wankhede cricket stadium. I believe the fourth test between Australia and India was on at that time. India won the match, but lost the series 2-1 :-(. The tall building in the foreground is the Hilton Towers. Till a few years back it used to be called Oberoi Towers. More than 30 years old, the hotel is a landmark, and with the Air India building lends a very distinctive look to Nariman Point. To follow up on my last post on Open World Mumbai (link to post) there are going to be keynotes by senior Oracle executives like Charles Philips (President, Oracle Corporation), Derek Williams (Executive Vice President Asia Pacific Division), Krishan Dhawan (Managaing Director, Oracle India), and Mark Gibbs (Senior Vice President Applications Sales, Asia Pacific Division) leading industry figures like Mr. K.V.Kamath (Managing Director and Chief Executive Oficer, ICICI Bank), S. Ramadorai (Chief Executive Officer & Managing Director, Tata Consultancy Services), and Pramod Bhasin (President & Chief Executive Officer, Genpact – formerly GE Capital Information Service) are also slated to speak. ICICI Bank (link to corporate site) is India's second largest and largest private sector bank with assets of about US$40 billion, while TCS is India's largest IT software and services company (with annual revenues of INR 91 billion - that would be approximately US$2.1 billion at the then prevailing exchange rates). Apart from BI presentations, there will be two demo pods on Business Intelligence in the demo grounds. These will feature the latest production software and consultants from OracleDirect and product management and development will be on hand to answer queries. Specifically, product management and development will answer questions people may have on what's in the works and what to expect with future releases. For example, Oracle announced Oracle Application Server 10g Release 3 (that would 10.1.3 for short) last year (see link to article on TheServerSide.COM) and you can expect to get some answers on what's new and maybe even see some previews of the software there at the demo grounds (see link to the 10.1.3 release on OTN). There are three BI related sessions; the first one will be presented by Rajesh Gadodia. I had presented on the same topic at the 2004 Open World in Mumbai, and had Kirloskar Cummins as a co-presenter. At that time Discoverer and Oracle BI 10.1.2 was in pre-production stage, and we were still a couple of months from releasing the product to the market. 10.1.2 has now been in the market for over a year and doing quite well (look at the earnings of one of the . One of the things that I will talk about in the demo grounds will be a few of the things we are working on. I am working on talking about a couple of exciting new things that are in the works. You may already have heard them through your Oracle account manager or sales rep. I don't know yet who the other two presenters are. All three tracks fall under the Enterprise Technology track. There is a mini Open World in Mumbai (Bombay) next week (Jan 10, 11 2006) (link to Oracle.com page) that I shall be attending. This is similar to the last Open World held at Mumbai last year oops... in 2004 (it is 2006 now! ), albeit on a slightly smaller scale I think. The 2004 Mumbai Open World was very successful it seems, and hence the encore.